Recently, when I read Livia Day’s A Trifle Dead, I discovered a sub-genre of novels previously unknown to me: culinary crime. Across our planet, a move from selfies to photographing what you eat is trending. And so many of us think about food all the time and love to see colour on our plates. As a result, I am inspired to take a break from the chronological postings about my last walk and introduce a food which barely has a connection with my walk. An earlier blog post showed me passing the property Linden. Over the Derwent River from Linden is the area known as Hayes, made memorable because until 2012 it housed a minimum security farm prison. I was surprised when I strolled through the Bathurst Street Farmers Market recently. 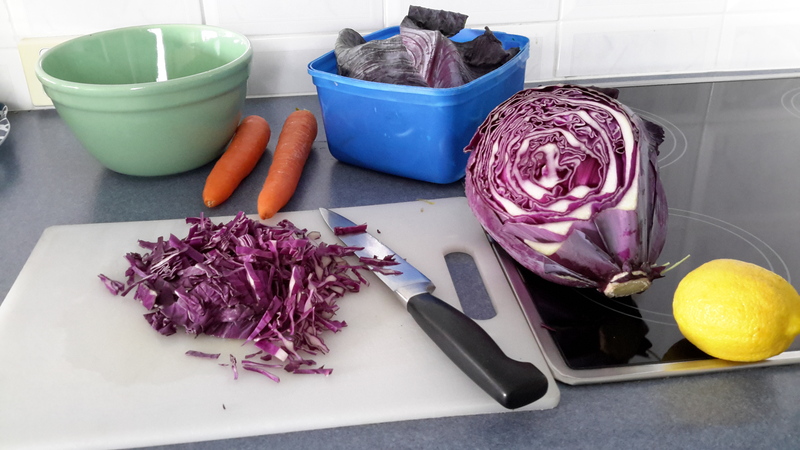 A table full of beautiful red cabbage heads lay before me. When I chatted to the growers, I learned these cabbages were grown on their property which borders the Derwent at Hayes. 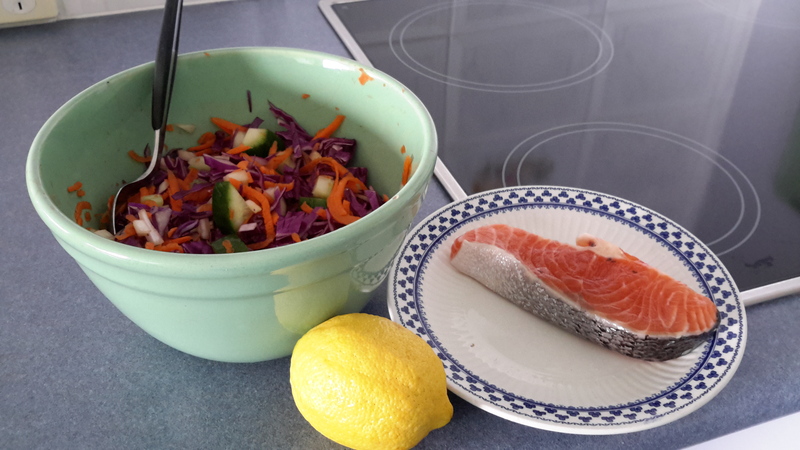 Back home, I chopped a salad and prepared to cook a small salmon steak. Organically grown, delicious, clean and fresh. 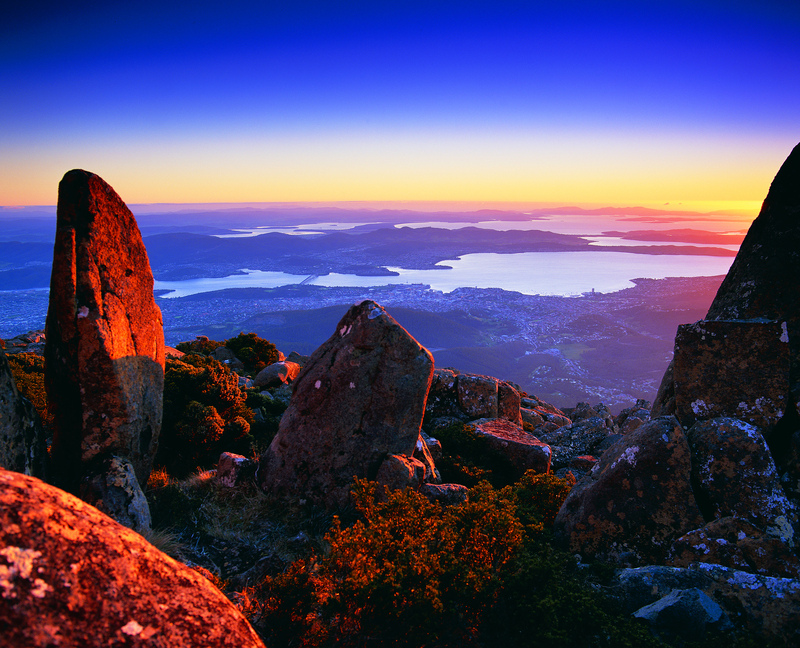 This entry was posted in Derwent River, Tasmania, Walking and tagged A Trifle Dead, Bathurst Street Farmers Market, cabbage, crime, culinary, Derwent River, Farm Prison, food, Hayes, Linden, Livia Day, novel, red cabbage, salad, Salmon steak on September 30, 2015 by Tasmanian traveller. Then cook the salmon both sides until the middle is slightly pink but not quite cooked, and remove from heat (it keeps cooking once off the heat and by the time you eat it is cooked). Cut into a few pieces and mix through the salad. That’s all I did. Keeping it simple. This is typically how I eat – sometimes with chicken, sometimes with an egg or two, and sometimes with no protein except a sprinkle of nuts such as almonds. Really – I just invent with what is to hand. My version of peasant food.